I was born and raised in Rome. Yes, I am lucky. And I am proud of this. Since I was very young, like all Romans, I started a sort of familiarity with that important person that lives a few kilometers away from my home: the Pope. When I was very little, I remember I saw Paul VI (now a Blessed) on his way to visit a sick Cardinal. But this is a very distant memory. The Pope of my youth was for sure John Paul II. I remember him visiting my parish in the heart of Rome. I was then an altar server and he greeted me and the other altar boys in the oratory of the Church. When he greeted me, he was already looking at the next person, as he was used to doing, because he wants to be sure that he can be approached by everyone. Later on, I became one of the organists of Saint Peter Basilica in the Vatican and I was asked to be in charge of playing for the Pope’s weekly audience. I did that for almost 7 years. 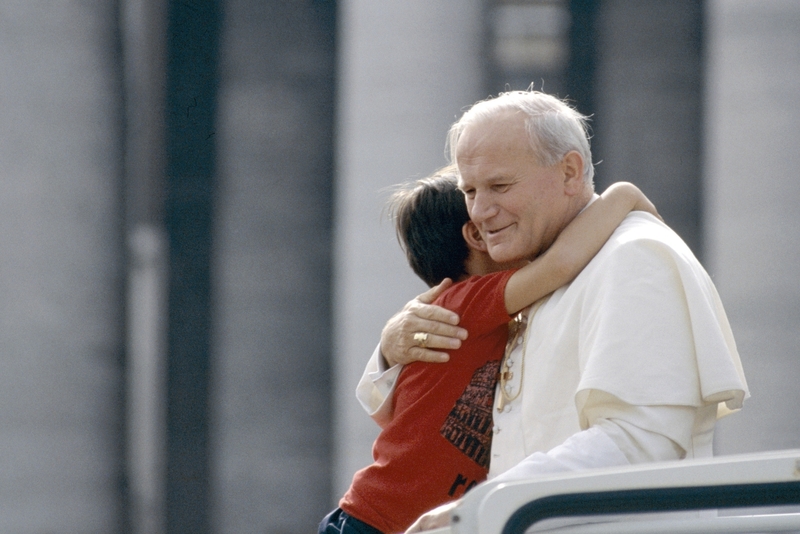 Those were the last years of John Paul II: he was sick, he could barely talk, so you can imagine that he could not sing. Indeed I remember him as a young man, in my parish, really vigorous and then I could see his flesh torn by sufferance and his voice that was the shadow of the voice of many years before. I remember I was always concerned when I had to give him the intonation for the Pater Noster. The problem was that he could not catch the tune easily in his last years and so when a mistake was done, of course everyone looked at me (in the square there were sometimes 50,000 people…). I think that many times, behind his window in the Apostolic Palace, he was considering how life is a transitional moment that can give you a lot and ask you as much. For me, he is linked also with a time that will never come back in my life, a time when everything around me looked big and important; now, forced to live in the stars, everything looks little and useless. Io sono nato e cresciuto a Roma. Lo so, sono fortunato. E sono fiero di questo. Da quando ero giovane, come tutti i romani, é cominciata una specie di familiarità con la persona importante che viveva a pochi chilometri dalla mia casa: il Papa. Quando ero molto piccolo, ricordo di aver visto Paolo VI (ora Beato) mentre andava a visitare un Cardinale malato. Ma questa é una memoria molto lontana. Il Papa della mia gioventù é sicuramente Giovanni Paolo II. Lo ricordo visitare la mia Parrocchia nel cuore di Roma. Io ero allora un chierichetto e egli mi salutò insieme agli altri chierichetti nell’oratorio della Chiesa. Quando mi salutava, lui già guardava alla persona dopo, come usava fare, perché volevo essere sicuro di poter essere approcciato da tutti. Più tardi, sono diventato uno degli organisti della Basilica di San Pietro in Vaticano e fui chiesto di essere responsabile per suonare all’udienza settimanale del Papa. L’ho fatto per quasi 7 anni. Quelli erano gli ultimo anni di Giovanni Paolo II, egli era malato, appena poteva parlare. Si può immaginare se poteva cantare. In effetti lo ricordavo giovane, nella mia parrocchia, pieno di vigore e ora lo potevo vedere la sua carne tormentata dalla sofferenza e la sua voce che era l’ombra della voce di molti anni addietro. Ricordo che ero sempre preoccupato quando dovevo dargli l’intonazione per il Pater Noster. Il problema era che non prendeva l’intonazione facilmente negli ultimi anni e se c’era un errore, naturalmente tutti guardavano me (nella piazza alcune volte c’erano 50000 persone…). Io penso che molte volte, dietro la sua finestra del Palazzo Apostolico, egli considerava come la vita é un momento di transizione che può darti molto e chiederti anche molto. Per me, egli é connesso anche con un tempo della mia vita che non tornerà più, un tempo quando tutto intorno a me sembrava grande e importante; ora, forzato a vivere nelle stelle, tutto sembra piccolo e intutile.